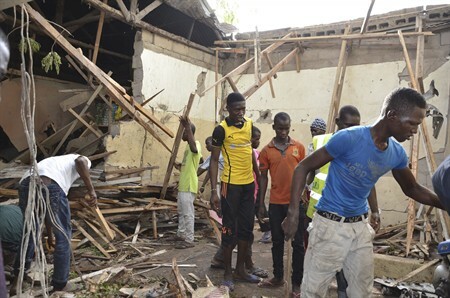 JNN 01 June 2015 Abuja : A Suspected Wahabi Boko Haram suicide bomber who managed to beat all security checks and got to a mosque inside Maiduguri market, by pretending to be a hawker, killed 16 persons and injured nearly 30 others, witnesses said. The Suicide bomber, a young man pushing a wheelbarrow loaded with some fruits, was said to have waited until Muslim traders crowded themselves in small market mosque before he moved in to detonate his suicide belt, according to witnesses. 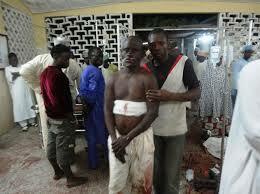 The blast resonated in most parts of Maiduguri at about 3:30pm. Mr. Ali said he was lucky to escape because he was yet to finish his ablution before joining the prayers when the incident happened. Market officials told him 16 people died in the attack. They were not specific about the number of injured victims. No group has claimed responsibility for the attack, although Wahabi Group Boko Haram is suspected. The attack came less than a day after Boko Haram Terrorists launched a grenade attack on the city, killing about 17 people just hours after Nigeria swore in Muhammadu Buhari as its new president. Mr. Buhari has vowed to confront the group which has killed over 15,000 people. At his inauguration, the president said he will relocate the military command structure to Maiduguri until the group is subdued. This entry was posted in AFRICA and tagged Africa, Boko Haram, Borno State, Governor Kashim Shettima, Maiduguri, Maiduguri Market, Mallam Ali, Mosque, Muhammadu Buhari, Nigeria, Suicide Bomber, Wahabi, Wahabi Group Boko Haram. Bookmark the permalink. ← Who are Ismaili’s – Aga Khani & Bohra’s ? What is the Difference between them and the Main Stream Shia Asna Asheris ?